Nothing with the eyelets, but there is some more work now. The scuppers need to be drilled out. 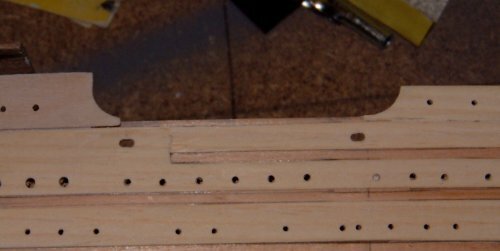 These were marked as per the instructions, then 2 1.5mm holes were drill so the almost touched. The drill was moved sideways to join the 2 holes, and finally finished off with sandpaper. The photos show both the inside and outside of the bulwark. you may notice that one of the scuppers has a lump out of the top. Not quite sure how that happened, but a tiny bit of filler will sort out the problem. Peadar McFadden posted a message in my Guest Book to say that he disagreed with me about the eyelets and he liked them. Modelling is a very personal hobby and what one person likes, another hates. Neither person is wrong. As long as you are pleased with you model, that is what's really important. If I gave the impression that I was telling people not to fit the eyelets, then I apologise. What I meant was that I don't like them, and I am not going to fit them. How many hours does it take to build the model ? ?